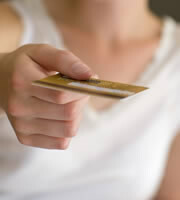 Use the links below to see credit cards from specific credit card companies as well as other special card categories. Bank of America Credit Cards - Profiles of some of Bank of America's most popular credit cards. Chase Credit Cards - Listing of Chase-branded credit cards as well as partner/affinity credit cards issued by Chase. Citi Credit Cards - Listing of Citibank credit cards, including branded Citi credit cards for consumers and Citi business credit cards, plus partner/affinity credit cards issued by Citibank. Discover Credit Cards - Listing of Discover Card options, including credit cards issued directly from Discover Bank and Discover credit cards issued by banks on the Discover Network. HSBC Credit Cards - Compare HSBC standard and rewards cards. Visa Credit Cards - List of popular bank credit cards affiliated with Visa. Gift Cards - American Express, Visa or MasterCard gift cards. Prepaid Cards - Cards that are accepted like credit cards, but function as debit cards, with each purchase coming from the prepaid amount loaded onto the card. "Retired" Credit Cards - Discontinued credit cards no longer available. 0 Responses to "Credit Card Companies - Cards By Issuer"